My favorite Flexible Flyer story involves a boy's bravado, an icy hill, and a front tooth. On a snowy afternoon in 1964, as I commanded my younger brothers to watch how fast I could go, my smile collided with a crusty chunk of Massachusetts winter. Undaunted, I sledded on until dusk - a testament to the thrill of hurtling downhill atop the invention of Moorestown industrialist Samuel L. Allen. 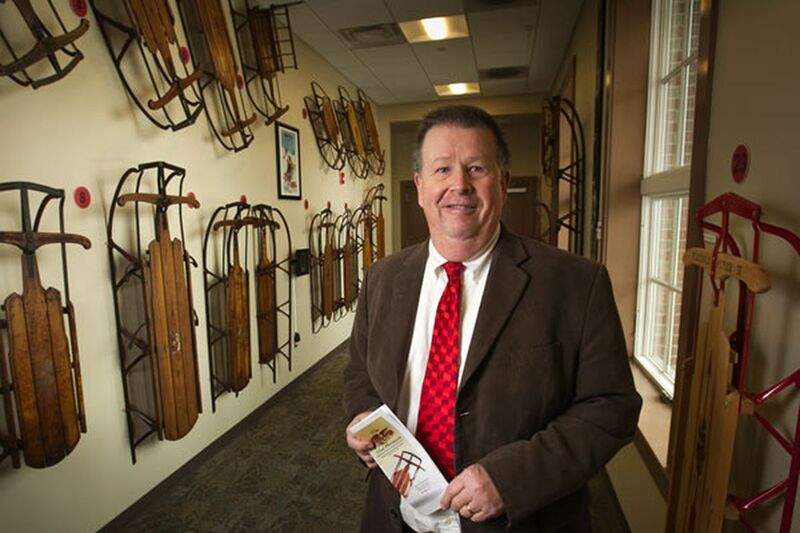 "Everybody who visits this exhibit has a story, it seems," says Joseph Galbraith, with whom I'm sharing my childhood recollections as we tour the "Flexible Flyer Sled Museum" at the Moorestown Library. "We're very big on promoting historical facts about the town," says Galbraith, the library's director. "It's cool to have a Moorestown invention on display where everyone can see it." Most of the 27 vintage sleds are on permanent loan from Philip Snow, a collector with a perfect surname, local roots, and a deep appreciation of the Flexible Flyer story. "Growing up in Delran, I always had Flexible Flyers," says Snow, 54. "They were the best." Allen, who owned a Philadelphia farm equipment factory, patented the sleds in 1889. His invention was steerable, durable, and beautiful - a utilitarian yet elegant combination of mass production and craftsmanship, of hardwood slats (the "deck") and lightweight, yet sturdy, steel frames and runners. No wonder the Flexible Flyer has become a collectible. "About 25 years ago, my wife and I bought one for our kids at an antiques store," says Snow, a banker who lives in Ocean Grove, Monmouth County. "It was an 'Airline Ace' from the 1930s." The model originally sold for $3.45; Snow paid $20 for it. More recently, he spent $300 to obtain the centerpiece of his collection - a magnificent six-person Model 6, the largest Flexible Flyer ever made. He found it on Craigslist. Last August, with the collection outgrowing its basement home, Snow approached Galbraith about displaying the Flexible Flyers. Snow designed and installed the permanent exhibit, which opened in January and has been well-received. "Parents and grandparents came through with kids and were saying, 'I had a sled just like that one,' " he says. "The sleds get people talking. They resonate." Most of Snow's Flexible Flyers are from the early 20th century. They are arrayed along the walls of a high-ceilinged, light-filled corridor that connects the library and the municipal building. "The exhibit is something a town can be proud of," says Henry Morton, 79, a retired owner of Paricon, the Maine firm that owns the rights to the Flexible Flyer name. "The Allen company produced a very good product," Morton says, noting that Flexible Flyers are now built in China ("the quality is excellent") and retail for as much as $150. "The name has become an iconic name in sleds," he adds. Some of Allen's descendants still live in South Jersey, including Samuel L. Allen III, a businessman married to State Sen. Diane Allen (R., Burlington). And the brand's fame may explain why Moorestonians generally are aware that the inventor of the Flexible Flyer resided in town, Galbraith says. Contrary to local lore, Flexible Flyers were not tested at Moorestown's Stokes Hill, and the Allen company was not involved in preserving the popular sledding spot. Family ownership of the company ended more than 60 years ago, and the former factory buildings in North Philadelphia were damaged by fire in 2009. But, as the exhibit attests, the sleds endure. And so do memories like mine.